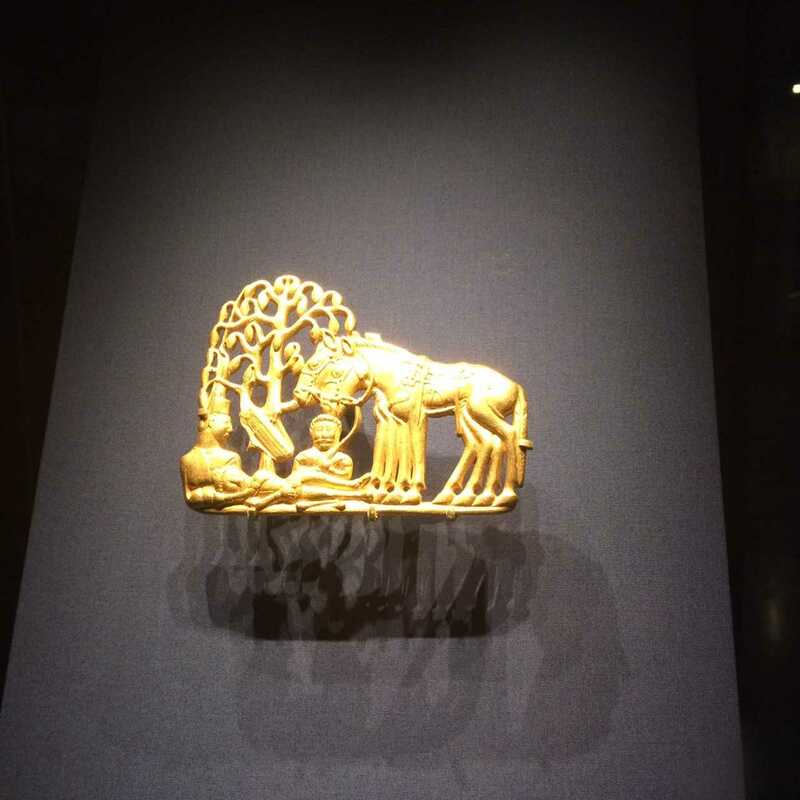 Figure 1: a gold belt plaque depicting Scythians resting under a tree with their horses. This artefact demonstrates the Scythians’ sartorial sophistication and the importance of horse riding to their everyday life. From the exhibition at the British Museum, photographs (c) Roberta Magnani. At the beginning of The Knight’s Tale, Geoffrey Chaucer celebrates the victory of Duke Theseus over the formidable Amazons. Once invincible women warriors, they have now been bent into submission by the powerful ‘conquerour’. Much like their land, here aptly renamed ‘Femenye’, which configures femininity as a space to be occupied and conquered, Queen Hippolyta has been ravaged and taken with brutal force. She is now, alongside her sister Emily, reduced to what Luce Irigaray would define as an ideal paradigm of femininity, a war trophy, that is, a silenced ‘mirror’ reflecting back Theseus’s patriarchal power. Their exile from Scythia, their homeland, marks the obliteration not only of their female masculinity, but also of the racial identity. As they travel to Athens with Theseus’s impressive army, their complex and hybrid ethnicity is eradicated and recast as a model of white Western femininity. Scythia, in fact, is a capacious geographical and cultural signifier: extending from Siberia to the Black Sea, it is at once a liminal and an expansive space which encompassed a richness of ethnicities and traditions far beyond any restrictive Euro-centric and fundamentally white Christian subject position. The gender and cultural binaries that the Amazons defy, both as phallic warrior women and as nomadic hunters roaming vast expanses of land, are firmly re-established once they arrive in Athens; in its architectural and power structures, Theseus’s Athens resembles more those medieval Western European cities with which Chaucer was so familiar than ancient Greece. Enclosed in walled gardens, policed by phallic towers, and subjected to the male gaze, the Amazons are no longer powerful warriors straddling the boundaries between East and West, and masculinity and femininity, but they are normalised as acquiescent virgins whose futurity can only be imagined as an inescapable heteronormative trajectory towards marriage. It is with a profound sense of loss and nostalgia for such a heroic figuration of femininity that I eagerly booked our tickets for the exhibition Scythians: Warriors of Ancient Siberia hosted by the British Museum, which ran from 14 September 2017 to 14 January 2018. I longed to encounter the unadulterated fierceness of Scythians women. I was desperately seeking traces of Emily and Hippolyta’s past as self-determining phallic women, expertly hunting and fearlessly fighting in the vast expanses of land beyond the confines of the walled garden. My longing for their Amazonian past was mostly, but not fully, sated by the exhibition. At the exhibition the beautiful archaeological finds and the helpful maps conveyed effectively not only the enormity of the territories controlled by the Scythians, but also the sophistication of their civilisation. Projections on the walls of the exhibition space showed the lands they occupied as awe-inspiring but often inhospitable landscapes. The assumption is that their nomadic life-style and the harsh conditions they had to face would dictate a rather Spartan existence geared towards mere survival rather than indulgence in wasteful pleasures. This was most definitely not the case. Their complex mercantile and cultural exchanges with neighbouring civilisations, objects of all kinds, from cooking tools to fearsome weapons, musical instruments, intricate fabrics and garments, and rather elaborate contraptions to consume recreational drugs point in the direction of a powerful, fierce, sophisticated culture known as much for its military prowess than for its unapologetic penchant for revelries. 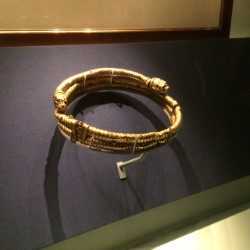 Figure 2: an elaborate torc probably worn by a man. Far from being a rudimentary civilisation, the Scythians were accomplished hunters, riders, warriors, and artists, with a love for sartorial decorations and partying! From the exhibition at the British Museum, photograph (c) Roberta Magnani. Rows and rows of sartorial embellishments, from the smallest brooches to the most impressive buckles, fearsome torcs and ostentatious sheaths transported me to a proud civilisation whose prosthetics and gadgetry, as Jack Halberstam would put it, speak loudly of their ability to harness and celebrate the power of the body, and its profound connections with nature and the land. While admiring those beautiful artifacts, I could imagine Emily the Amazon riding fearlessly across those awe-inspiring landscapes, strong and athletic, confidently making her presence apparent by sporting one of those extravagant headgears that Scythian women were so well known for. Unmistakably phallic, the women’s hairstyles render them a formidable presence in the landscape. A CGI projection pictured a Scythian man charging through a vast valley on his horse. Irrespective of the rather unimpressive pixilation of the image, this was such a missed opportunity. In Getting Medieval Carolyn Dinshaw describes history as a queer touch between past and present, queer because it breaks down the linearity of traditional accounts of time as a teleology moving inexorably towards the heteronormative imperatives of marriage, reproduction, death. Instead, much like Elizabeth Freeman in Time Binds, Dinshaw conceptualises history as a form of desire for the past, a longing to touch it and encounter it affectively. Safely protected by glass cases, the impressive vestiges of this extraordinary civilisation allow me to follow the footsteps of Emily and pursue my desire to encounter her outside the confines of the walled garden. They don’t, however, allow an affective interaction. The CGI projection could have afforded this opportunity by animating a detailed scene of formidable men AND women riding proudly in their full hunting or military attire; such vivid proximity would have (almost) made my dream of hunting with Emily true. 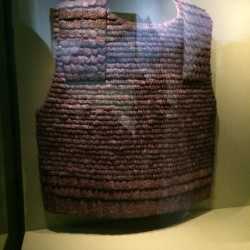 Figure 3: this impressive chainmail breastplate demonstrates the fearsome reputation of the Scythians. From the exhibition at the British Museum, photograph (c) Roberta Magnani. My longing for a queer touch with the mythological Amazonian past via the Scythians came, however, uncomfortably close to fruition when I was confronted with layers of human skin, remarkably well preserved by the extremely low temperatures of the burial sites in which the embalmed bodies of the Scythians were laid to rest. What was most astonishing about these precious relics of former lives were the remarkable tattoos adorning the skin of these fierce men and women. As the explanatory note placed next to the glass cabinet points out, the tattoos were clearly gendered, but in surprising ways. Perhaps predictably, the Scythian men, much like Theseus in The Knight’s Tale, wrote on their skin their desire to be viewed as invincible hunters, while women used their bodies to give voice to experiences of predation and torment. I read the writing on the Scythian women’s skin as a manifestation of their agency. In particular, I saw the markers of predation inked on their skin as evidence that traditional paradigms of femininity cannot be wholly applied to these formidable women. Writing on skin is an act of defiance of the type of enclosed and policed femininity to which Emily and Hippolyta have been condemned in Chaucer’s tale and in traditional figurations of medieval European white and Christian womanhood. Rather than an envelope or a blank canvas upon which the patriarchy writes and imposes its master narrative, as Irigaray explains, these Scythian women control the operation of writing and therefore of identity formation. Whether they self-fashion themselves as powerful hunters in the steppes, or whether they articulate visually their own experience of being predated, hunted and conquered (an ancient #MeToo), their agency becomes visible on the surface of their skin. Nonetheless, my desire to trace the steps of Emily’s warrior past was mercilessly thwarted. As one of the explanatory panels laconically explains, the archaeological evidence does not link the Scythians’ military activity with women. Notwithstanding this lack of irrefutable proof of the existence of real-life Amazons, I found something perhaps even more empowering: the vestiges of fiercely sophisticated and resilient women confidently straddling the boundaries between East and West while celebrating the power of their body and its pleasures. And all with amazing headgear and sartorial accessories. Realistically, I couldn’t have asked for much more.